Last major update issued on July 3, 2011 at 05:45 UTC. 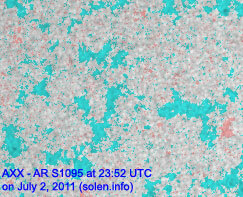 The geomagnetic field was quiet to unsettled on July 2. 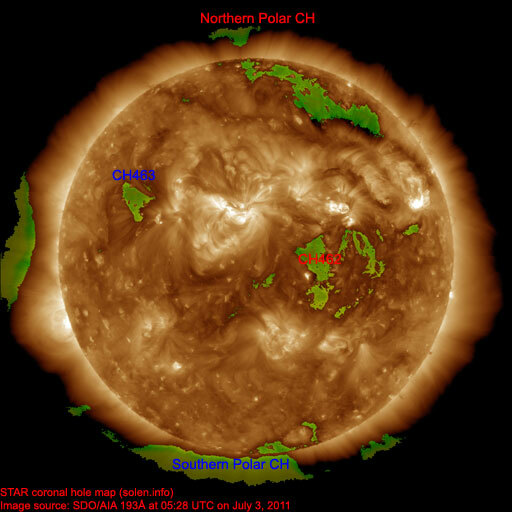 Solar wind speed ranged between 352 and 443 km/s. 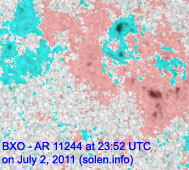 Solar flux measured at 20h UTC on 2.8 GHz was 85.6 (decreasing 15.3 over the last solar rotation). The planetary A index was 6 (STAR Ap - based on the mean of three hour interval ap indices: 6.3). 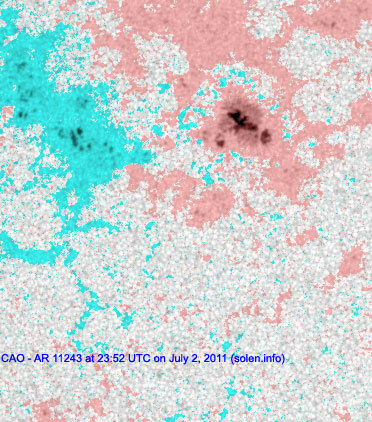 Three hour interval K indices: 00011223 (planetary), 11122212 (Boulder). 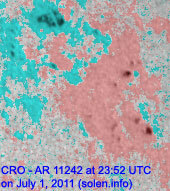 Region 11242 decayed further and could soon become spotless. 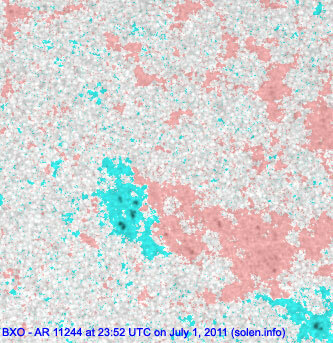 Region 11243 didn't change significantly and was quiet. Region 11244 developed slowly in the leading spot section. 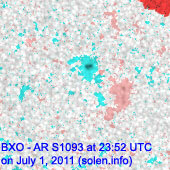 The region was the source of a B9.5 flare at 00:24 UTC on July 3. 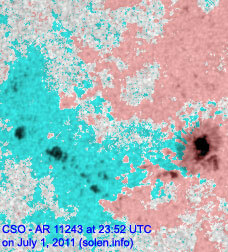 This event was associated with type II and IV radio sweeps and triggered a filament eruption and a CME. Earth could be in the path of the small CME. 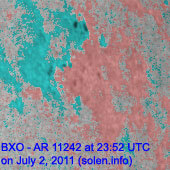 July 3: A small, possibly Earth directed CME was observed in STEREO imagery after a B9 event in region 11244 early in the day. 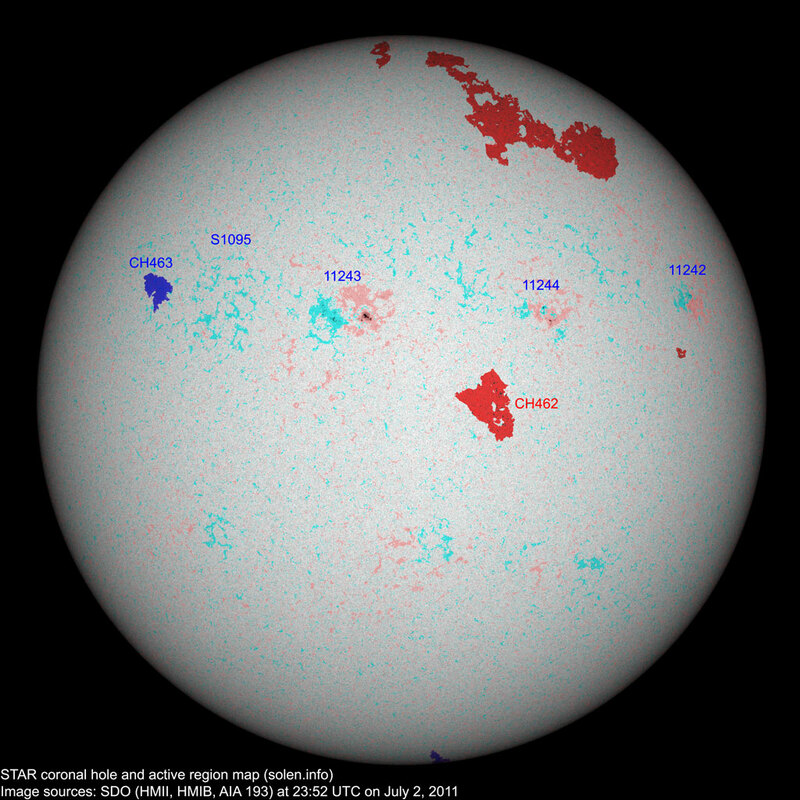 The geomagnetic field is expected to be quiet to unsettled on July 3. Quiet to active is likely on July 4-5 due to effects from CH462. 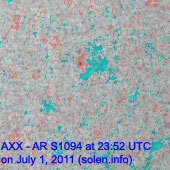 The CME observed early on July 3 could reach Earth late on July 5 and cause a few unsettled intervals.